As the hardtsking staff has previously noted, the fabulously wealthy Sackler family, which unleashed OxyContin on an unsuspecting American public, played a key role in the country’s current opioid crisis. 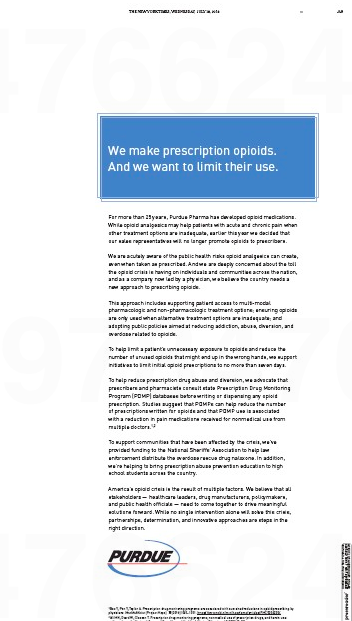 Adding insult to devastating injury, the family’s corporate arm, Purdue Pharma, has run a series of newspaper ads professing concern about the opioid epidemic while admitting zero responsibility for it. Latest example, from yesterday’s New York Times. Sure Purdue wants to limit the use of opiods, now that the Sacklers have made billions of dollars off the sales of OxyContin and the news media heat is on. Time to sack the Sacklers, yeah? This entry was posted in Uncategorized and tagged American Museum of Natural History, Berlin Jewish Museum, Chris Christie, Christopher Glazek, Commission on Combating Drug Addiction and the Opioid Crisis, Esquire, Guggenheim Museum, Harvard University, Louvre, Metropolitan Museum of Art, Oxford's Ashmolean, Oxycontin, Patrick Radden Keefe, Peking University, Purdue Pharma, Royal Academy, Sackler, Sackler Courtyard, Sackler family, September 11th every three weeks, Smithsonian, Tate Modern, Temple of Dendur, The New Yorker, Victoria and Albert Museum. Bookmark the permalink. There are more than just a few of us that depend on drugs like oxycodone to make it through the day with some semblance of reasonable activity. Throwing the baby out with the bathwater has proven to be somewhat unacceptable in most social circles. Indeed, there is a crisis of opioid addiction in our communities. And yes, treatment is far better for the addict and society on all sorts of levels. Consider what happened when the mental institutions were shut down to “mainstream” people who couldn’t care for themselves. And who became the victims of that well-intentioned, but misapplied concept? The people that couldn’t care for themselves, many of them now fill the ranks of the addicted or near-addicted for whom proper hospitalization and treatment is the way to a sober and constructive life. Certainly the Commonwealth needs to do much more to get on top of the flow of the drugs, and as an opioid user for confirmed clinical reason…multiple unsuccessful surgeries attesting to the issue…has seen, they are taking steps to do so. So let’s move carefully to help the millions of people who have a legitimate need without shortchanging the addict. Let’s also move carefully so as not to deprive those with legitimate, medically confirmed need for such medication in order to keep the addicting from continuing to abuse his body and mind to the point of fatality. p.s. Oxycontin is a short-acting opioid combined with the dosage of a single Tylenol pill. The downside for the medically appropriate user of that drug is the damage to the stomach that continuous Tylenol use can cause. Just an FYI. Don’t get me wrong, Mudge – I have nothing but sympathy for 1) people who need relief from serious pain, and 2) people who become addicted, mostly through no fault of their own, to painkillers. I just want those who have abused and profited from both groups to be held accountable. One question for you: Wasn’t the selling point of OxyContin that it was a slow-acting opioid that required fewer doses? As I recall, the greater quantity of opioid content made OxyContin more appealing to abusers.